Jennifer's thirtieth birthday party is supposed to be a special day. But what starts out as a day of celebration quickly spirals into a most ill-fated day Jennifer wishes she could forget, in this ensemble comedy set entirely in a kitchen. This odd movie of a collection of even more odd people selling their bodies for drug experimentation probably has some truth in it's plot line. The big pharma clinic looks like a hospital and experiments on animals and humans. Billy needs cash for debts, others are there for ulterior motives, others are because it's their only way to live. The staff is heartless and uncaring. The director is more interested in his personal project than he is interested in operating 'the clinic'. 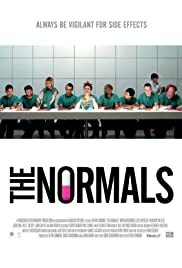 Told in a most surreal way 'the greens' or 'the normals' experience the effects of the drugs - some real others a placebo. Or are they reacting to this confined and bitter environment they must live in. Then the unexpected happens and Billy finds himself being offered a great deal of money! This is a fun movie not so much a funny movie. And I dare say in todays world there is most likely an element of truth within the story.